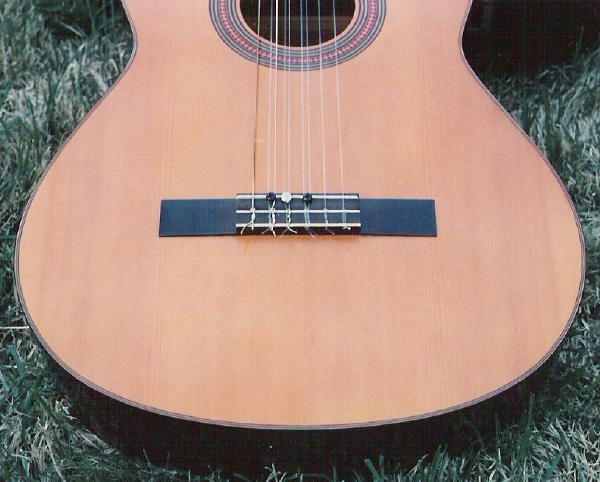 Quasi-Baroque guitar conversion; Ludovico Roncalli. Years ago I became interested in the Baroque guitar. Most of all, I wanted to play Baroque guitar music "faithfully". Not necessarily as faithfully as possible; that would require a real Baroque guitar, or at least a reproduction. One problem with that is the expense. As big as that problem is, for me, personally, there is an even bigger one: the need to reorient the hands to new fret and string spacings every time I switch back and forth between the modern and the Baroque guitar. I tip my hat to those who intrepidly take on that challenge, but... not me, brother! To be reasonably faithful, all you would need is doubled 4th and 5th strings. Then you can add the characteristic Baroque guitar high octaves to those pairs. It always seemed like it would be a very simple thing to add two extra string tuners on the head of the guitar and file a couple of extra slots in the nut. The stumper was how to drill two extra holes through the bridge for the added strings. After years of contemplation, it hit me all at once - I didn't have to drill holes in the bridge. I could simply feed two strings through the same hole and separate them with some kind of a spacer behind the saddle. This presumes, of course, that the two strings will fit through one hole. On my first guitar, a Yamaha G-50A, they do with no problem. I was off and running. I went to an instrument repair shop and they sold me a couple of used steel string-type tuners for a buck. I cut some little pieces of paper to the size and shape of the tuners and slid these around on the underside of the head until I found good positions for them. These positions were marked. A couple holes were drilled for the tuning barrels and the machines were attached with little screws. Slots were filed into the nut next to the slots for the 4th and 5th strings using my Revlon nail file. I took a guess at the proper separation. My slots are 2 millimeters apart (center to center) and work fine. I found some small screws to serve as the spacers down at the bridge. Keep in mind that they do not actually screw into the wood. At this point I may have yelled, "Voila!" If I did, it was slightly premature. The next headache was finding the right strings. To double the 4th string with a high octave, I planned to use a 1st string tuned down a step to D. Likewise, to double the 5th string, I planned to use a 2nd string tuned down to A. With the guitar strung this way, it didn't take long to realize that there was simply too much total tension on the 4th and 5th courses. I wasn't worried about the instrument, which is quite robust, but my fingers would soon ache pressing two strings at once - requiring just about twice the accustomed pressure. Trying to find the proper strings dragged me into the morass lute players call "string calculation". This deserves a whole article in itself. (See my web page on the sensible string measure.) In a nutshell, let me say the current situation is a complete mess. First of all, classical guitar strings are sold in sets - not in a range of gauges like steel strings. Second of all, even if they were sold in a range of gauges, the gauge, or string diameter, is not a useful measurement. Given the scale length of your guitar, the desired note and the desired tension, you can calculate the mass per length of the string you need. This is the defining characteristic of a string - regardless of composition. A practical unit would be "grams per meter". Unfortunately, string manufacturers do not supply this bit of information. Using high- and low-tension classical guitar strings, plus some thin lute strings, I rigged up something that worked pretty well. Even then the tension was a bit much for my hand so I lowered the whole thing a half-step. I'm sure when a few more people convert modern guitars to quasi-Baroque guitars, a combination of careful string calculations and some trial-and-error will yield a general solution to this problem. This quasi-Baroque guitar works very well. I have used it in two of the most important Baroque guitar tunings. Both have a treble/bass pairing on the 4th course. The tunings differ in that one also has a treble/bass pair on the 5th course, while the other has treble/treble. 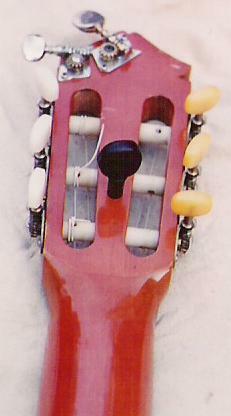 Gaspar Sanz supposedly used no basses on either the 4th or 5th course, so you could simply use a modern, single-strung guitar with treble A and D strings on the bottom. Was Gaspar nuts??? Has anybody ever had satisfying results playing his music without basses? I'm always waiting for somebody to take a closer examination of what he wrote and announce, "Hey, we've been misinterpreting! That's not what Sanz meant!" The goal of not having to reorient going from the modern to the Baroque guitar was almost met. One slight difference in feel is that, with the doubled strings, you have to be a little more careful with your right-hand finger strokes. It's easier to hit an adjacent string by accident. But this problem is surmountable and doing so may just benefit your technique on the modern guitar. I wondered whether the tuning machines for the added strings could be improved upon. I had a viola peg installed between the slots of the head. After using it a while, I found advantages and disadvantages. The viola peg is lighter, simpler and maintains the symmetry of the head. It is just more "in tune" with the spirit of a Baroque guitar. On the other hand, it's much easier to fine tune with the machine tuners. The viola peg was added as an experiment, but since it was there I put it in service doubling the 3rd string for even more authenticity. 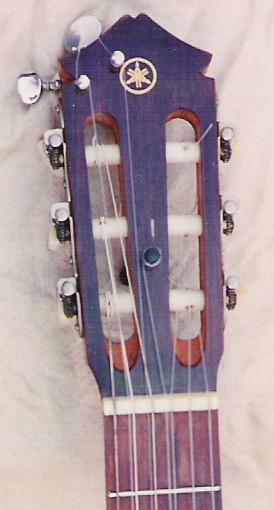 The pictures below show the modified head, front and back, and the unmodified bridge with double-stringing. Here is a quick summary of the ideas presented above. You can very simply modify a modern guitar into a quasi-Baroque guitar with doubled 4th and 5th strings. Use one of your old student model guitars. The modifications required are: steel-string tuning machines or viola pegs, extra slots in the nut, and spacer screws behind the saddle. Finding the right strings is a problem, but you can come up with something if you have a few thin lute strings to experiment with. This leaves us with the final question: what to play? Certainly not Baroque guitar music transcribed for the modern guitar; that would be absurd. There are dissertations that include transcriptions of Baroque guitar tablature into music notation, but many of these are useless to the performer since they notate the high octave of the 4th and/or 5th course. An exception to this is Richard Pinnell's work on Francesco Corbetta which includes all of his music written so that, if you read as you normally would for a modern guitar, your fingers go to the right places. You can buy facsimile editions of the Baroque guitarists, but the problem there is the widely varying types of tablature, and often big problems with legibility. I tip my hat to those who take on that monster, but, once again... not me, brother! My own solution was to write a tablature program for my computer. Since then I have seen inexpensive tablature programs advertised. I don't know how easy they are to use and whether they are smart enough to convert from fret-letters to fret-numbers, or from upside-down to right-side-up tablature. Still, I suspect this is the way to go for the time being. 2. We need publishers to put out Baroque guitar editions faithfully translated into this modern tablature. 3. And we need string makers to sell strings in a range of mass per length. Here is a Gavotte by Ludovico Roncalli faithfully translated into a modern tablature. It corresponds to the tablature facsimile shown in Frederick Noad's Baroque Guitar anthology, page 8. Compare these tablatures with Noad's transcription for modern guitar on page 48 of the book. The transcription makes a very nice piece for our classical guitar. It also concisely shows up the main differences between Baroque guitar music and what our modern ears have become used to. Roncalli's original tablature (and this translation) includes strums, trills and chord inversions - all very characteristic elements of Baroque guitar music - which were left out of the transcription.